On this day in 1953, Jacqueline Cochran became the first woman to break the sound barrier. Piloting a Canadair F-86 Sabre that she had borrowed from the Royal Canadian Air Force, Jacqueline took off from Rogers Dry Lake, California and flew at an average speed of 652.337 miles per hour. Cochran’s career in aviation began in the 1930’s after a friend offered her a ride in an aircraft. While she ran a cosmetics business, Jacqueline began flying lessons at Roosevelt Airfield in Long Island and learned to fly in three weeks. A natural, she earned her commercial pilot’s license in two years. Her husband, Floyd Bostwick Odium, was a savvy businessman and saw the commercial opportunities for her and her cosmetics company. Jacqueline named her company “Wings” and began flying around the country in her aircraft promoting her products. Cochran flew in her first major race in 1934. From that point on she worked with Amelia Earhart in opening races and the field of aviation to women. In 1937 Cochran was the only woman to compete in the prestigious Bendix race. By 1938 she was the preeminent woman pilot in the United States having won the Bendix and set new altitude and transcontinental speed records. After America entered WWII in 1942, Jacqueline became head of the women’s flight training program for the States. As director of the Women’s Airforce Service Pilots (WASP), Cochran trained over 1000 female pilots. For her efforts in WWII she received the Distinguished Service Medal and the Distinguished Flying Cross. 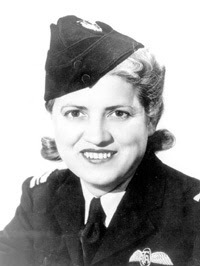 Jacqueline Cochran died in 1980 at her home in Indio, California. At the time of her death, Cochran held the most speed, distance and altitude records of any pilot, man or woman, in aviation history. And now a toast to Jacqueline Cochran!